Today I get to share with you the first item that was sent to me from the very nice people over at Jack Wills, the Laceby Boyfriend Shirt. I really like the blue and white checkered pattern on this shirt. It definitely screams summer, and I have been really digging the whole menswear trend. I tried to add some girly details like the flower pin on my trench and my black heels and pearl necklace to balance it all out. I imagine wearing this shirt with a skirt to a summer picnic or with boyfriend jeans and sandals to a farmer’s market. What’s fun about this shirt, and most menswear-inspired pieces, is that you can dress them up or down. Although the shirt has the look and feel of your boyfriend’s button down, it is fitted and has some pink detailing on the inside of the collar and on the cuffs. It is a bit snug around the hips, so keep that in mind when ordering your size. I have on a size 8, and I have found that Jack Wills, which is based out of the UK, has very similar sizing to H&M. Previous Post How was your weekend? I love plaid button downs. 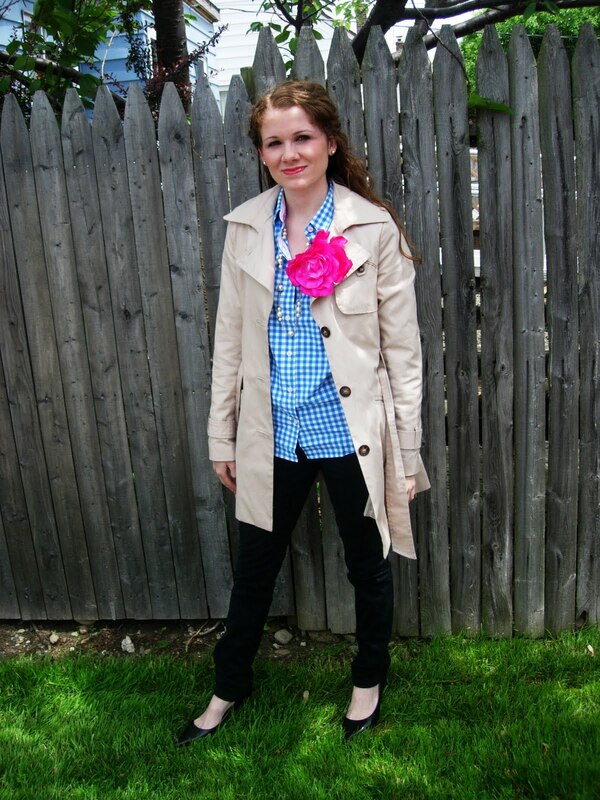 You look so cute and love that you added the flower pin to your trench. I love that beautiful flower with the gingham – great combo!